How far are you willing to go for all-you-can-eat sandwiches? It’s a big deal when Chick-fil-A opens a new restaurant location. Not only do area residents have new access to one of America’s most popular fast food chains, but they also have a chance to score free Chick-fil-A for a year! 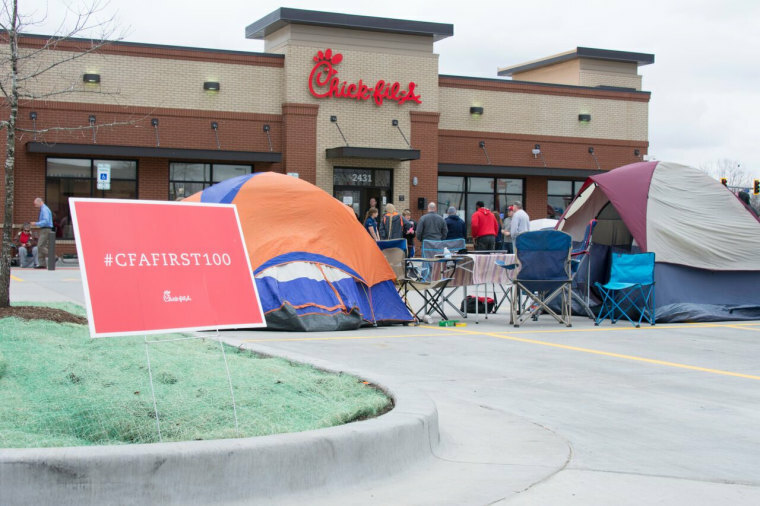 The First 100, which dates back to 2003, occurs when the owner of a new Chick-fil-A franchise invites locals to camp out overnight in the parking lot, so they can be one of the first 100 customers into the store when it opens the next day. 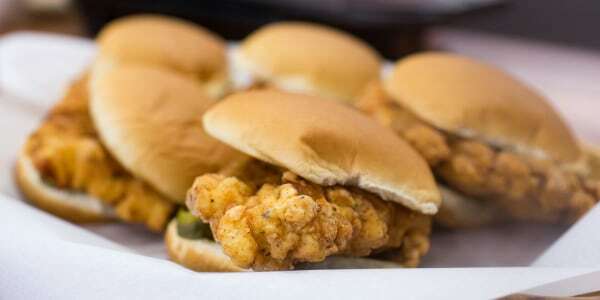 All of the lucky people who endure the elements get free Chick-fil-A for a year, which comes in the form of 52 coupons each valid for one Chick-fil-A sandwich seal. And of course, there’s nothing like the moment when Chick-fil-A hands over those free meals! However, not just everyone is eligible for this free perk for Chick-fil-A during every store opening today. The last time a new Chick-fil-A in Wichita, Kansas, opened in 2012, the opportunity to win the free food was open to literally anyone who made the 100-person cut-off. But that caused a mighty big problem when, according to the Wichita Eagle, people showed up from all over the country. “What happened a few years ago is that some people would travel the country all summer just to go to openings, and although we love them, too, we thought it would be better to have local people win, to connect with our community,” Jason Lansdown, owner of the new restaurant at Maple and Ridge Streets, told the paper. Sensing a problem that could spiral out of control, the chicken chain implemented new measures in 2015 that many franchisees have since adapted. Now, new Chick-fil-As opening limit participation in the First 100 to those who live in specific zip codes, which are verified by checking an individual’s drivers’ license. Fans can first visit the Chick-fil-A web page that lists new store openings to find eligible zip codes for each location. In addition to the Wichita store, which opens Aug. 30, Chick-fil-A has four additional stores opening during the month of September including locations in Nashville, Tennessee; Dothan, Alabama; Findlay, Ohio; and Pasadena, Texas — with most planning to host First 100 events the night before store opening. The chain said it opens nearly 100 stores every year so there's a good chance a Chick-fil-A is coming to a chicken-loving locale near you, soon.